JakartaGlobe (27/6/2014) Bangkalan, East Java. Irham Rofii stands out from your run-of-the-mill Muslim preacher, even here on the island of Madura, off the coast of Surabaya, which is home to a bevy of high-profile clerics and their Islamic boarding schools. Irham also runs a school, but with a difference: He is known as a “green pioneer” in his community and, most recently, a biomass energy champion. “It used to be overheated here in Madura. Now you’re arriving here drenched in sweat, but in the past we were scorched [by the sun],” the 48-year-old says, recalling how dry and barren the subdistrict of Geger in Bangkalan — one of four districts in Madura — was just a few years ago. Irham took to planting trees in the area, which was a challenge given how nutrient-poor the soil was. Soon after he took charge of Darul Ittihad, the Islamic boarding school his father had founded, Irham began using his influence as a local religious and community leader to encourage residents to follow suit in planting trees. The Islamic clergy holds strong sway over local communities in Madura, more so than in most other parts of predominantly Muslim-populated Indonesia, and the Madurese are said to trust their clerics more than government officials. “So when I set the example, people came to believe that planting trees was good. 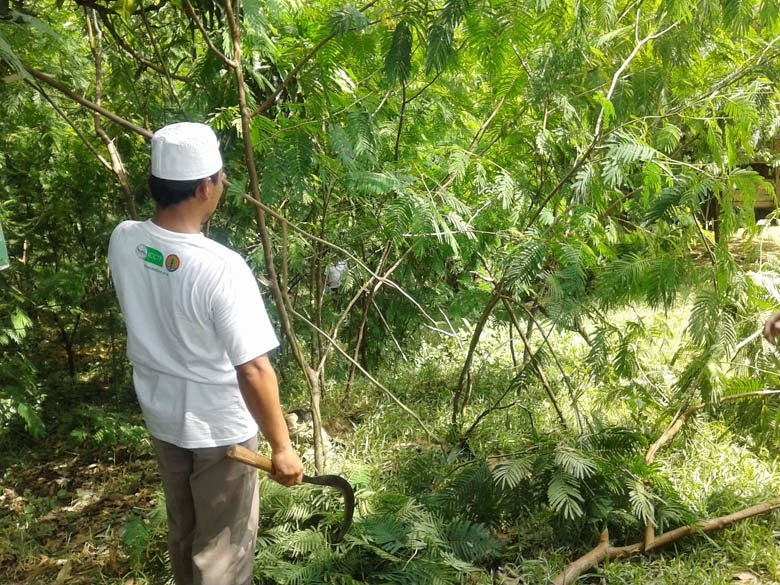 So they began to do it too,” Irham says, adding that reforestation is now considered by local residents as an activity that has religious merit. Geger has since been transformed from a once barren area. Houses sit along a road that cuts through the subdistrict, into Kombangan village where Irham lives, looking almost like intruders in an old-growth forest — when in fact it is the various trees and shrubs now growing densely in the area that were introduced more recently and now provide shelter from the searing heat of the day. “It used to be impossible to grow rambutan trees here,” says Irham, whose tree-planting campaign has earned him the nickname Kyai Hutan (Forest Cleric). “If you’d been here two months ago, you could have easily picked the rambutan off the trees around here,” he adds, pointing to a tree not far from where we sit, as he addresses guests — local and foreign — who have come to see his latest project. Having essentially created a forest where before there was none, Irham is now involved in another green project, one that has been going on for the past two years, this time on renewable biomass energy — more specifically, wood pellets. The project was proposed by Yetti Rusli, an adviser with the Forestry Ministry, and approved for funding in 2012 by the Indonesia Climate Change Trust Fund (ICCTF). The ICCTF is a body under the National Development Planning Agency (Bappenas) tasked with managing funds from international donors to support climate change mitigation activities in Indonesia. Upon a request from South Korea, which is set to boost its biomass energy use in order to cut carbon emissions, the Bogor Institute of Agriculture (IPB) conducted a study in 2011 to examine potential of four plants for development as energy wood pellets, an environmentally friendly alternative to carbon-heavy coal. Yanto Santosa, a professor of ecology at IPB and an adviser to the ICCTF, says the four plants were red calliandra, Gliricidia, white leadtree and ear tree. The study found that pellets produced from each plant released near-zero carbon emissions and heat of around 4,600 to 4,700 calories per kilogram — nearly as much as coal at 4,800 to 5,500 calories per kilogram. Calliandra (Calliandra callothyrsus) came out the winner due to its high productivity. The other plants tested, meanwhile, took longer to grow, which meant lower productivity. “Higher productivity means faster absorption of carbon dioxide,” Yanto adds. He says calliandra also has the highest density, which explains its less than 1 percent ash content, meaning the wood is highly combustible with near-zero emissions — a good indication of a clean fuel. Noer Yanto, former official with the local forestry agency who is also heavily involved in the wood pellet project in Geger, says calliandra has another advantage in that it can grow in nutrient-poor soil and degraded land. It does not require fertile soil to grow in, and in fact its nitrogen-fixing ability allows for other plants to grow more easily — making it perfectly suited for Madura, a large part of which remains dry and barren. Those are the reasons why calliandra, native to Panama and Mexico and introduced in Indonesia in 1936, was chosen as the raw material for wood pellets in the ICCTF pilot site, he says. A total of 214 hectares in three villages in Geger have been dedicated to growing the plant — some interspersed with other plants — after Irham, Noer and Ghozali Anshori, another local public figure, encouraged members of the local farmer’s cooperative, Gerbang Lestari, to participate in the project. Gerbang Lestari was founded by Irham. The cleric has even allowed a plot of his land to be used to house the factory that will process the wood. He got his students and residents to help build the factory together, with funds from the ICCTF. “We want our students to be good not just in religion, but also in science and technology,” Irham says. A total of Rp 2.5 billion ($207,000) has been allotted for the project, including Rp 1.2 billion for the wood pellet mill, most of whose parts were shipped from China. The machine, half-assembled in Indonesia, was ready for use a month ago and has been on a test run since then, processing narrow calliandra trunks and branches into wood pellets. Daru Asycarya, a Forestry Ministry official supervising the project, says it has drawn the interest of several prospective buyers, including one from South Korea who wants to buy 300 tons of calliandra wood pellets per month. No deal has been inked, though, Daru says, as the mill is still in the testing stage and only has a production capacity of a ton per hour or around 220 tons per month. “We want to first make sure that we can produce prime-quality products that will be more widely accepted,” he says. As for local customers, Daru says, some tea growers in West and Central Java as well as cement maker Holcim have expressed interest in the wood pellets for use in their operations. Syamsidar Thamrin, the ICCTF secretary, has other uses in mind. She says calliandra wood pellets can be an ideal solution for the electricity needs of many of the remote villages across Indonesia, especially on the smaller islands that remain beyond the reach of the national power grid run by state-owned electricity firm PLN. “Wind power is not always economical. Solar cells remain expensive. Kerosene is cheap only because it’s subsidized. And don’t forget the cost of fuel shipment,” Syamsidar says. “Calliandra, though, is cheap. I hope this project will be replicated, and later on scaled up for the whole of Madura. And in 10 or 20 years from now, I hope [calliandra wood pellets] will be used to support ‘power the villages’ programs,” she adds. With as many as 24 million hectares of land across Indonesia categorized as degraded or barren, Yanto says there is a large potential for industrial-scale calliandra cultivation and a massive wood pellet industry that will benefit not only local farmers and communities with additional incomes, but also Indonesia with a new potential power source, and eventually the world, with reduced carbon emissions. Indonesia is currently facing an energy crisis, with domestic oil reserves expected to be depleted by 2025 if no new reserves are found. Gas reserves are expected to last only for another 30 years, while only highly-polluting coal is expected to stay around for longer — for the next 60 years, according to the Agency for the Assessment and Application of Technology (BPPT). But despite the situation, and the amounts of carbon the fossil fuels emit into the air, the development of sustainable and renewable alternative energy sources in Indonesia has been going at a snail’s pace. Fossil fuels still dominate Indonesia’s energy mix, with less than 5 percent coming from renewable sources, namely hydro-electricity and geothermal power, according to 2010 data from the Energy and Mineral Resources Ministry. Syamsidar dismisses concerns that a wood pellet industry will turn out like the palm oil industry, which has led to the wholesale destruction of huge swaths of pristine forest to clear land for oil palm plantations. If that were to happen with the calliandra industry, experts say, it would go against the whole point of producing clean energy for lower emissions.